I have used Rest Easy for about a year now. I LOVE this product because it makes me feel certain that I am preventing bedbugs from becoming an issue in my bedroom and in my home. The clear mist that I spray around my bed and also on the floor area around my bed seems to kill anything that would come into that area. I use it also around the corners of my platform bed and have never seen any signs of a bedbug. This is especially important for me as I live in an 8 unit townhouse and a few of my neighbors are not so clean. I want to make sure that my living experience is not affected by them. I would use Rest Easy no matter where I lived or when I travel. Really has taken the worry away from having bedbugs while living in NYC. For the last 2 months I was beside myself with the mystery of what had invaded my home. I pride myself in being a very clean housekeeper. I've lived all of the country and in my fifty years I have never, ever, been so completely and utterly tormented with bugs bites! I threw out my down comforters and pillows. Shampooed my carpets. I went to Home Depot and bought every pest control spray under the sun. We took all my pets to the Vet to be treated for fleas and ticks. Nothing was working! When I suggested to my husband that we throw out our $4000.00 Chatham & Wells bed.....he flipped....We finally called Terminex and they treated the interior and exterior of our home. Our house was built in 2005 and it never occurred to me to have it treated for bed bugs. But whatever was giving my sleepless night drove to the internet and finding out about bed bugs! Bad idea! My shock and horror at what can be brought home from a simple overnight stay put me to bed armed with a magnifying glass and flashlight. I would wake up at 2 am itching and scratching all the while by husband slept like a baby. I didn't know bugs could be so selective and I didn't know that some people react so terribly to the bite. An allergic reaction that sent me to see two different Doctors. First a primary care Physician and them finally a Dermatologist. Once we finally made it to Bed, Bath & Beyond to purchase the mattress covers , a very nice girl suggested we try Rest Easy. Thank God. Something as simple as an organic, environmental friendly spray aptly named REST EASY gave me back my life.... and probably saved my marriage. Until you go through something like this, people think you are crazy. You become obsessed with finding the enemy and getting your life back to normal. Rest Easy did that for me. I've purchased eight 16 oz. bottles from the store since then. I now spray in it in my closet, others bedrooms, basically every room in my home. We spray it on our luggage and even in the cars. People always comment on the wonderful smell. It smells like a cinnamon candle is burning. I love it and will always have a bottle on hand.....just in case. I want to tell you what a blessing your Rest Easy bug spray has been for me. I suffered from flea bites for almost two months and had tried several different chemical sprays and "bug bombs" without luck. Then I tried your product in my home. I was able to spray inside my dresser drawers and all over my bed without fear of harming my unborn baby. Right away I noticed less biting. I also sprayed the rest of the house and within about two weeks we were flea free!! I was losing my mind and so I can't thank you enough for your Rest Easy. I'm grateful that you developed an effective and healthy alternative. Your product worked great on the ants and spiders as well!! It was nice to just spray it on the ceiling and watch them fall. Howard, I appreciate your return phone call and thank you so much for your time! But more importantly, thank you for your product "Rest Easy". I first read of your product several months ago in a magazine and immediately located it at Bed Bath & Beyond in Florida. As a flight attendant for a major airline, I stay on an average of 180 nights a year in various hotel chains. And more often than not, I came home from my trips covered in bed bug bites. Believe me, it wasn't only the disfiguring bites that were such great concern, it was the uncertainty as to whether I would be bitten that caused me endless sleepless nights as well. You can't imagine how it feels nor do you sleep going to bed knowing that at some point the bed bugs might ultimately show up and feast! Thanks to your product, which is aptly named, I truly CAN "REST EASY" as I have not had a single bite since I have started using it. It has provided me with complete piece of mind as I know that your product REALLY WORKS!! I simply spray shortly after checking into my room and by the time I am ready for bed, I know that it is working. And what a great aroma it has. Very soothing and calming. I have even sprayed my fellow crew members beds upon check in so that they too, can REST EASY". Your product is AMAZING! Not only am I bed bug bite free, but I am sleeping like a baby! I am recommending it to everyone I know as I have complete confidence in it's ability to do exactly what is says it will do. Thank you again for such a great product. I can't imagine traveling anywhere ever again without it! Helen T Obrien - Naples, FL. We at SDS JANITORIAL SUPPLIES in NY are pleased to carry REST EASY bed bug eliminator to our line of quality janitorial supplies. We are an approved vendor for New York public schools systems, along with servicing high end hotels and motels. We get nothing but a positive feed-back from our customers, The pleasant odor, easy application, and the end result makes this a desired product. I sprayed this around the bed and on the sheets, though the product suggests that you may not need to spray bedding directly (and that it might stain) but my deep red (ironic I know) sheets didn't showany signs of staining. The product seemed vague as to whether the spray deters or kills bed bugs, but I did spill a drop on my finger and it stung for an hour, even after washing immediately. I put on gloves after that and let everything dry well before sleeping. I've yet to have a bed bug problem when travelingbut belive this would act as a deterrent for a night or two's stay. Others have mentioned the smell, and it is a very strong cinnamon aroma. It's a bit like turning your room into a pack of Big Red, but that was mitigated with air freshener. Keep a window open just in case. I don't have any chemical sensitivities but the smell got overwhelming in a few spots. Rating 4 stars because I only just used the product yesterday and managed to sleep through the night unmolested by the little bugs. However, this was the last step after putting all sheets, pillows, pillowcases, duvet, duvet cover and mattress pad into a plastic bag on the way to the laundry room: visually inspecting and disposing of bugs and then washing them all on hot for an hour then drying on hot for an hour. I've also purchased impermeable pillow and mattress protectors designed to block allergns and bed bugs. These were methods gathered from various internet sources about dealing with a "problem" on your own, not an "infestation". For serious bed bug problems one should call a professional. Most remedies and retail items available to the home consumer are about deterring the bed bugs or killing "the one's you can see" in hopes of blocking the food source (you) from the bugs or making it worth their while to seek food elsewhere. My apartment building is rather old, so I'm sure that when the bed bugs are "evicted" from one apartment, some make their way to other units. This product helped with my bed bug problem, but only as one step in a larger prevention method. I bought this product after discovering that we had a problem. One day, my husband decided to test it on one particularly brave little critter. He sprayed a ring around it and can you believe that it kept still because it had nowhere to go. It created an actual barrier that the bed bug would not pass. After seeing this we sprayed the mattresses down and any upholstery. Everything died! I was truly amazed. We've since moved out and gotten rid of everything. I highly recommend this product to anyone that needs it. I do a lot of overnight travel for business. I have always been concerned with bed bugs after seeing the reports on T.V. My friend suggested I try this product and gave me a sample. It works great and now I feel better about staying overnight in hotels. My wife makes sure we bring it along with us on family trips. I just ran out and can't be without this. Great idea on the travel size bottles. At first I was skeptical about the product. But I had to go on two business trips and with all the news about bed bugs I figured I'd take a shot and buy the Rest Easy. Prior to traveling I actually called the manufacturer and asked how the product was to be used. They told me this was a preventative only and would not be effective if you had an infestation. If you did then you needed to call a professional and then use Rest Easy as a preventative. The 2oz was for when I traveled to different hotel's so that I would not get bitten. They told me to spray around the bed, in the dresser drawers, in the closet, some on the carpet and some around the base boards. They also said that if I sprayed the bed and sheets to make sure it dried before laying in it. By doing this I would create a barrier to protect me against getting bitten. And also that if the bugs came in contact with the oils, that it would stick to their shell and also kill them. They said for me to spray inside my luggage right before I left to come home so I would not bring any live bugs to my home. They also said that you should take your clothes out of the suitcase and directly put them into the washer as soap and water will kill them in case they are in your clothes. With all that being said I have no idea if the two hotels I stayed at had them as I did not get bitten. So whether they had bugs in the rooms or not I slept great! And the product has an awesome cinnamon smell. I saw that some of the reviews said mint, but it's actually cinnamon. If you want peace of mind then buy this. It's great and it's a green product so it's also great for the environment. 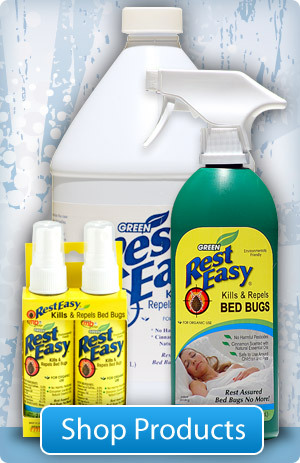 I would just like to thank you for introducing me to the Rest Easy bedbug product. Since we started using it, we have had 90% success in one visit bedbug control. Aside from an excellent product, it is also a “Green” product. I don’t know about people you work with but those we encounter love to hear green and also love excellent results. That is why we are so happy with the Rest Easy Bedbug product you provide us. If you ever have any potential customers that are on the fence about trying Rest Easy, feel free to give them my phone number and I can explain how well it works (856-296-1831). With all my gratitude for your time and helpfulness in responding to my questions about bed bugs and Rest Easy in particular. I love your product! This product absolutely works as advertised. We actually experienced bed bugs at a posh hotel last year. We had no idea what the bites were from until we did some research. After that incident we now take it wherever we go. This is our third time buying this product and I would recommend it over any other bed bug spray out in the market. The 2oz travel size is great for trips and best of all it's all natural and the product kills all other small insects. We spray this on ants and spiders when we get them in the house and within 5 seconds they are dead...which is one reason we've had to order it 3 times. One thing though. You have to shake this very good for the full effect.